Spooky but awesome! Nice shot! Great Pic! I hope the sky looks like that on the 31st! Took time to figure out what it was! Spooky yet beautiful! great moon shot for this spooky time of year! Perfect shot for October. Happy WW! Very cool shot :) So SPOOKY :) T.
That is an incredible shot!! What a wonderful image you've captured! 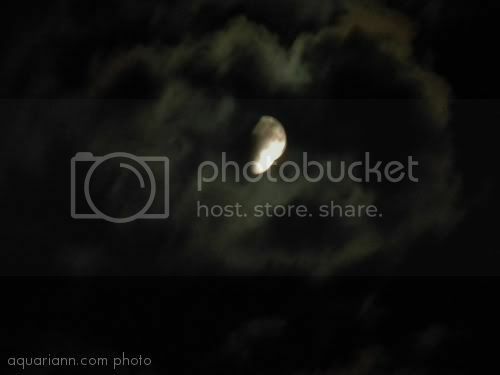 Ghostly Moon Indeed - Happy Wordless Wednesday! Perfect photo for the season! Happy WW! Love your ghostly moon..enchanting, mysteriously beautiful!! Fabulous! Way cool shot and ghostly too. Beautiful moon shot ... perfect precursor for Halloween! Great photo - it's tough to get a good shot of the moon. I really like the way the clouds are lit up. Perfect for this month!!! We're so close to Halloween! Love the moon veiled in clouds....gotta get myself a better camera to take photos like this. Thanks for posting, and have a mysteriously moonlit WW. Beautiful, girl! Such a nice photo! Wow, awesome photo! Perfect for fall, especially with Halloween right around the corner. That definitely is a eerie looking moon! Thanks for the stumble! Stumbling you back.